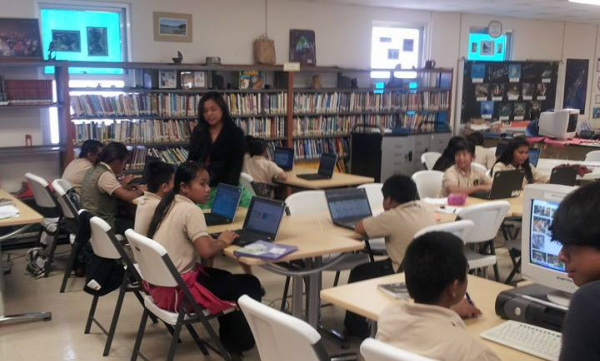 Welcome to the Luis P. Untalan Middle School Wildcats Library! - Welcome! The library's mission is to provide information to students and staff in a variety of formats, teach the skills to use them, and instill the desire to read and explore as lifelong learners. 2. We protect library books and furniture. 3. We ask for assistance when needed. 4. We eat and drink outside the library. 5. We obey all school rules. The library is available to students everyday from 8:15 AM until 3:15 PM. You may visit the library to do research, borrow books, read, or study, but you must have a pass from your teacher during class time. You do not need a pass during lunch or when you are with your teacher. You must have a pass with your name and the correct date and time signed by your teacher. You must place your bags on the floor before entering the library. You must follow all library rules. You must check out books 15 minutes before the bell rings. Be sure to push in your chairs and leave the library calmly when the bell rings. Be sure to close the library door when you leave. Library books can be borrowed for 2 weeks at a time. Books may be renewed after those two weeks if you are not done reading them, but you must come in and check them out again. Two books may be borrowed within a two week period. If you return one book during that time, you can check out another book for another two weeks. Reference books may only be used in the library and may not be borrowed. When a book is overdue, a fee of 10 cents per school day will be charged to you. If you wish to use the computer, you must first sign-in on the computer sign-in sheet. Computers are to be used ONLY for conducting research and/or typing and printing. Computers may not be used for playing games. There is no set time for computer use; however, if there are others waiting, a ten minute use is recommended, so everyone will get a chance to use the computer.